One out away from a no-hitter, Jordan Shipers admits he was anxious on the mound. But it didn't deter him from following his gameplan. "I got a little bit more nervous there," Shipers said. "I just kept doing what I was doing the whole game, just pounding the strike zone and hoping they hit it to one of my guys. And they did." Ranked as the Mariners' No. 11 prospect, Shipers tossed a nine-inning no-hitter on Wednesday as the Class A Clinton LumberKings blew out the West Michigan Whitecaps, 10-0. 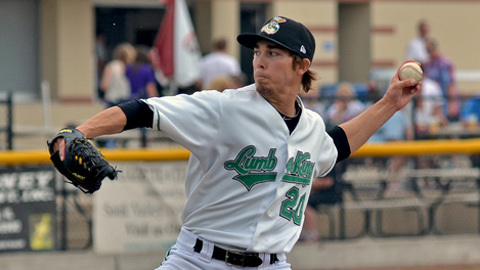 The no-hitter is the first in the Midwest League since May 4, when the LumberKings themselves fell victim to Wisconsin's Chad Thompson and Mark Williams. Domingo Valdez was the last player to toss a no-no for Clinton (July 9, 2003), while Scott Dunn was the last to complete a nine-inning effort for the team (perfect game; Aug. 3, 2000). "It feels great, it was pretty exciting," Shipers said. "It was the first one in my career. I enjoyed it a lot." Only three West Michigan batters reached base on the night -- two on walks and one on a throwing error by second baseman Daniel Paolini. Shipers generated 15 groundouts, induced seven flyouts and fanned two in the outing. "I had good life, a lot of sink on my four-seamer tonight," Shipers said. "I mainly just threw that and a couple two-seamers. Just let them drive it into the ground. "I'm a contact pitcher, so they can hit the ball. I get ahead early and hope they hit it." Both walks came with two outs in the fourth. Eugenio Suarez drew a free pass, then moved to second on a wild pitch by Shipers. But Aaron Westlake walked moments later. Shipers got out of the frame by inducing a flyout off the bat of Jeff McVaney. "It was just a lack of focus, I guess," Shipers said. "I made some good pitches that didn't get the call, but it happens. ... I was under control. I just didn't execute my pitches." The LumberKings more than lived up to their moniker, racking up 12 hits in the win. Kevin Rivers led the squad with three base knocks, including a double, while Jamal Austin, Ramon Morla and Daniel Paolini each drove in two. Did that affect Shipers' approach on the mound? Not one bit. "I pitched like the game was tied," he said. "I didn't change anything. I just kept going after batters." Drafted in the 16th round of the 2010 Draft, the Mariners went over slot to pry him away from Missouri State. The investment proved to be a wise one when Shipers struck out 47 batters in 49 2/3 innings last year for the Class A Short-Season Everett AquaSox. Shipers has followed up on that campaign by compiling a 3.18 ERA through 99 innings this year and earning a place in the Midwest League's All-Star Game -- despite allowing 20 runs in 25 1/3 innings in June. "I got pretty tensed up while I was pitching," he said. "I was trying to do too much with my pitches and guide the ball to where I wanted it and not really just let it go. It wasn't working, so I just said the heck with it. I just started throwing again." Considering Wednesday's performance, it seems Shipers' new approach has been working out. Not surprisingly, the 21-year-old left-hander isn't planning on switching things up any time soon. "I'm just going to keep on my routine and not really change anything," he said. "If it's working, don't change it." David Heck is a contributor to MLB.com. This story was not subject to the approval of the National Association of Professional Baseball Leagues or its clubs.